You are so beautiful, to me..., originally uploaded by CidnieC. This is a beautiful photo. 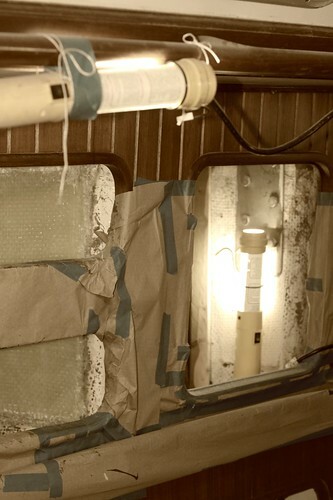 Ok, maybe the beauty of this shot is not apparent but this is a shot of our punky bulkhead right before the last layer of fiberglass was applied. Mark tried to explain to me what the last bit of glassing was but what I heard was " Blah, blah, structural integrity, blah blah forces, blah , blah , blah web for strengthblah, blah the soft deck is repaired, blah, blah butyl tape, blah once the chain plate is reinstalled this one is finished!" See how beautiful this shot is now? It's very beautiful blah blah blah! I don't understand blah blah blah, but I think it's safer or stronger or something blah blah!!!! So it's gorgeous!!!!! Sometimes when Eric explains things to me it's the same way!